If it’s paradise you’re looking for on your next holiday get-a-way; you won’t be disappointed with a Turkish yacht charter in the Gulf of Fethiye. 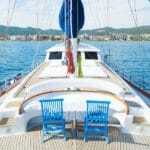 The benefits in chartering a gulet from the Fethiye region starts with a short-time transfer from the Dalaman airport. This is especially convenient for families with children after long air travel. While Fethiye is a mere 40 minutes from the airport, the port of Gocek is even closer with a transfer time of about 20 minutes. From this region there are a multitude of route options to consider. 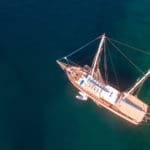 But if you prefer not to go too far opting for just the peace and quiet, the Gulf of Fethiye alone is plenty to offer this kind of yacht holiday experience. 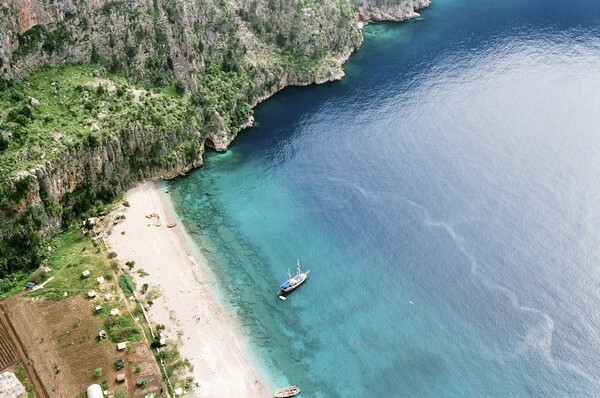 Butterfly Valley is one of the most attractive places in the surroundings of Fethiye. Butterfly Valley ( Kelebekler vadisi) in Turkish, is located close to Oludeniz, and can only be reached by boat. It got its name due to the extraordinarily beautiful Tiger Butterfly. Most of the butterflies can be seen in early June, colonies are flying into the protected valley until late October. Almost all types of butterflies that live on the Mediterranean coast, can be found in the butterfly valley. So if you are fascinated by butterflies and breathtaking, stunning surroundings, you must visit Butterfly Valley! Feature destinations in the area include the famous and one of the most photographed beach in Turkey; Oludeniz (also known as the ‘blue lagoon’). It is famed for calm waters even during storms. Gulets which travel to this region cannot moor too close by as it is a protected area. However will drop anchor in a nearby bay. 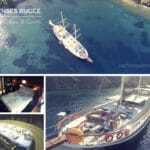 Oludeniz can be accessed by the tender on board your gulet. There are a few small shops for souvenirs and a couple of restaurants to enjoy a dinner out. 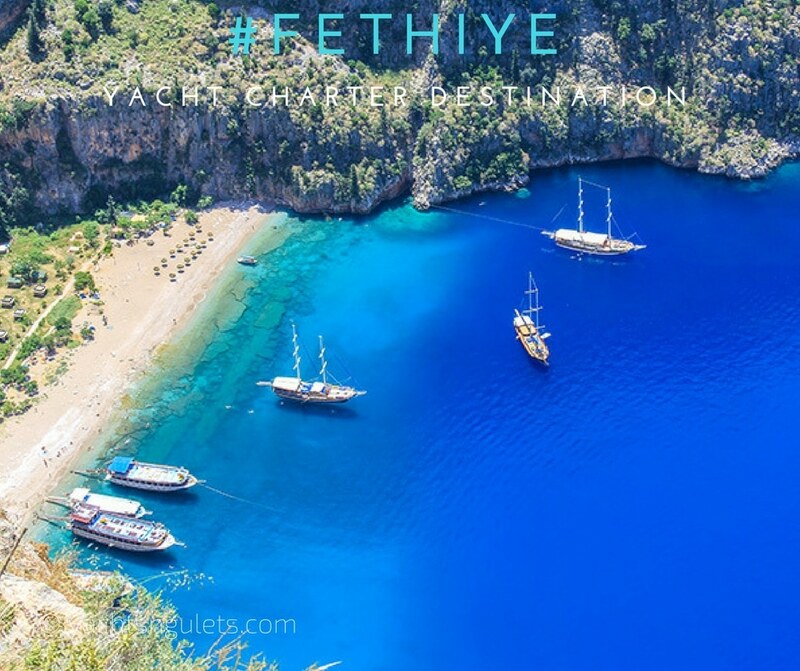 Another well known place to visit in the Fethiye region is the spectacular Butterfly Valley, a must-see destination in Southern Turkey. It offers a beautiful beach and stunning scenery. Although a popular place, during certain times of the year you will find few boat traffic. Climbing the cliffs are dangerous and not recommended in Butterfly Valley. It is located in a pleasant villaged called Faralya and part of the Lycian way to Oludeniz if you’re hiking the trail. The valley received its name due to the large swarm of butterfly habitat near the waterfalls on the canyon. In addition to these amazing natural wonders, the gulf is filled with numerous other lovely private bays and hidden coves for a Turkish yacht charter holiday in paradise. The Yassica and Gocek Islands are also great places to drop anchor for a swim and snorkel – and also barbeque! Embarking from either Gocek or Fethiye can take you two ways. If you head west, you will be able to visit the Marmaris region and further south, sail to Rhodes if you wanted a bit of Greek culture in your travels. Pointing your compass in the opposite direction east, will lead you to the breathtaking Antalya region famed for the countless historical sites, ancient cities and archeological ruins such as Myra, Xanthos, Simena sunken city, and so on. 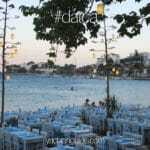 The Gulf of Fethiye and nearby destinations offer a fantastic combination of choices. There is something and some place, for everyone! To find out more details on your itinerary options, simply consult with your charter agent to help you plan the route that will make eveyone on board happy!